Eight years after a judge ruled in his favor, a revered Paterson cleric will return to court on Monday to once again fight deportation as federal authorities pursue allegations that he lied on his green card application about a conviction by Israeli authorities. 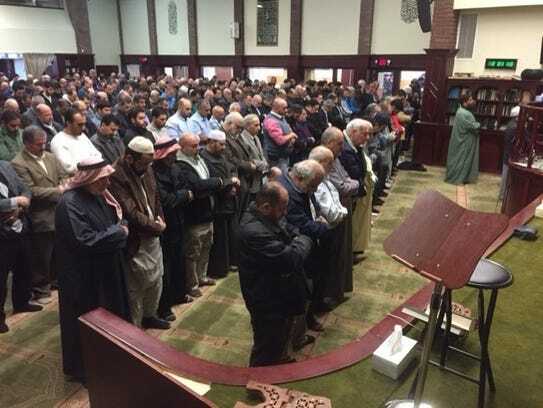 Imam Mohammad Qatanani, spiritual leader of the Islamic Center of Passaic County, known as a voice of moderation in New Jersey, broke the news to his congregation at services at the mosque Friday afternoon. “I know that justice will prevail and that everything will be in the right way. I believe in the judicial system in this country,” Qatanani said. Immigration authorities sought to deport Qatanani on grounds that he didn’t disclose an alleged arrest and conviction in Israel for being a member of Hamas, a group classified as a terrorist organization by the U.S. government. Qatanani denied ever having ties to Hamas and said he was detained, not arrested, by the Israelis during a trip to his native West Bank in 1993. Israelis never told him he was convicted of a crime and he never saw a judge, he said. Qatanani and expert witnesses had said Israelis routinely detained Palestinian men at the time. After coming to the U.S. from Jordan in 1996 on a religious worker visa to lead the Paterson mosque, one of the largest in New Jersey, Qatanani rose to prominence by forging bonds with leaders of different faiths and with law enforcement. Qatanani’s supporters rallied to his defense during his previous trial, and several testified about his character and good works. In September 2008, Judge Alberto Riefkohl of immigration court dismissed the case brought by the Department of Homeland Security, saying he found no credible evidence linking him to terrorism. Homeland Security appealed the ruling, and after a lengthy period of motions, litigation and review, the Board of Immigration Appeals sent the case back to Riefkohl, who will hear the case Monday and Tuesday in Newark. Qatanani’s lawyer, Claudia Slovinsky, said the judge is expected to revisit Israeli military court papers that Israelis claim are confessions. Slovinsky said that Qatanani had been tortured during his detention, as he testified during his trial, and that anything he signed had been written in Hebrew, a language he did not know. Seth Brugger, attorney for the Department of Homeland Security and Immigration and Customs Enforcement, could not be reached Friday afternoon for comment. The 52-year-old imam has served on interfaith groups and on the Muslim outreach task force led by the New Jersey Attorney General’s Office and frequently hosts officials from elected office and law enforcement at events at his mosque. Qatanani said he could work and live elsewhere, but his six children, three of them born in the U.S., have made their lives here. Also, he does not want to leave the people he serves. He fears it would send the wrong message to the community and especially youth if someone they admire is deported. Aref Assaf, spokesman for Americans for Qatanani, a group created to support the imam in his legal battle, said he was concerned that the court case could take on political tones in a climate where Muslims appear to be regarded with suspicion. He said he hoped that did not happen. “He’s a well-liked leader in our communty and we want to continue to have him as our leader,” he said. Amatellah Al-Yousefy, 42, of Paramus was upset on Friday after hearing the news. She said the imam encourages people to be good citizens and to respect the laws and democratic process in this country. People of different faiths in the community have reached out to express their support and many said that they want to be in the court on Monday, Abbassi said. “We are extremely confident now more than ever that ‘alhamdulillah’ [an Arabic word meaning “praise be to God”] will grant us victory one more time,” he said.